Saturday morning didn’t start so great. I went into the weekend knowing I needed a break from a couple of jobs I’d been doing, but also that I had some other things to get done before I dug into writing again. Jobs I was not feeling all that confident about. So, yes, I woke up just a little cranky. And then, mid-morning, as I was still in cranky mode, my husband told me to look outside. I know, for those of you who have been dealing with mounds of the stuff all winter, not a big deal. Or maybe just not a reason for happiness. But we’ve been in this house over 15 years, and I think we’ve maybe woken up to snow once? Saturday’s snow didn’t stick at our house. It did keep coming, though, sometimes mixed in with more rain, sometimes, less, for about 40 minutes. I stood and watched it for about 10. It was blobby and soft, little white shapes against a very grey sky. And all of a sudden, I was in a great mood. If I have to tie this to writing, I’d say–remember: there is always a reason. When your characters switch gears, when they go from up to down, or vice versa, there is a cause. It has to be solid; it has to be real. But it doesn’t have to be big. Sunday, of course, my husband had to explore. Did he get out his skis? His snowshoes? His warm boots? Nope. 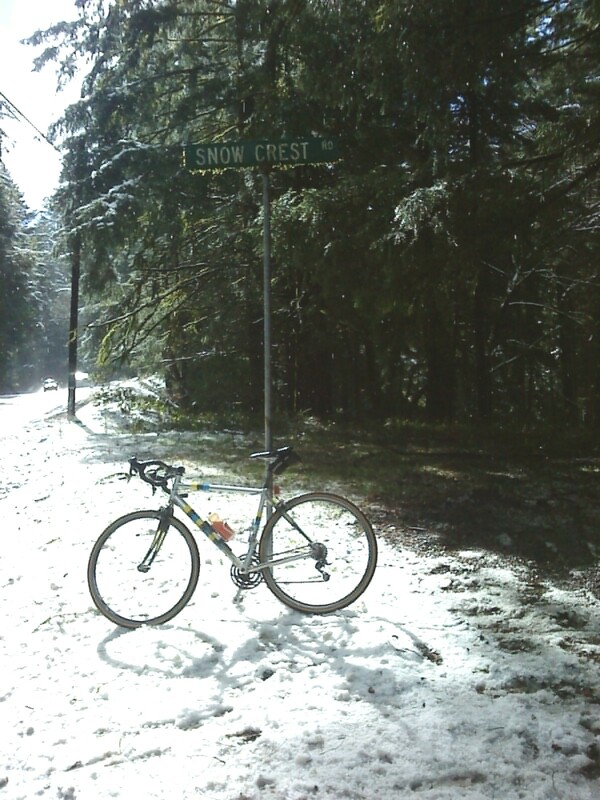 If you can’t read the sign, the street is named Snow Crest. I don’t know who put up the sign, or when, but this weekend their optimism payed off. And, I’d say, was contagious. I got both my jobs done, relaxedly and happily. And this week, I’ll weave my writing back into my work days. Wishing all of you a little bit of magic mood-lightener when you need it. It is–like a flipped switch in your brain. Wishing for some snow for your daughter, too! Snow usually cheers me up, too. It looks like we might actually get more this weekend–so more cheer coming!